The Central Presbyterian Church was located on Broome Street when it was given the building of the Fifth Avenue Presbyterian Church in 1876. The Victorian Gothic structure which sat on East 19th Street had been designed by architect Leopold Eidlitz in the 1851-1852. In a remarkably ambitious project, Central Presbyterian moved the entire church nearly 40 blocks uptown to West 57th Street. In October 1895 the two building plots next door to the church would catch the eye of the American Society of Civil Engineers. Founded in 1852, the organization burgeoned in the second half of the century as the infrastructure of America developed. The construction of bridges, aqueducts, water towers and other structures required the expertise of trained engineers. By June 1895 the Society, which had been making do with borrowed spaces for its meetings, recognized the need for a permanent headquarters, or Society House. With the site of the new building chosen, the members turned to its design. In November they voted “that the construction and architecture of the new Society House be entrusted to Members of the American Society of Civil Engineers and to none others” and the wheels of building a new headquarters were set swiftly into motion. In January 1896 the two plots were purchased for $80,000 and almost immediately a committee was formed to choose an architect. Plans budgeted for a $90,000 building of three stories. A competition among architect members and a select few non-members was initiated. The submitted plans were to include a ground-story reception area, meeting rooms, offices on the second floor and, above, a library and reading room. In November 1896 Eidlitz filed the plans. The three-story structure had now grown to four and the $90,000 cost had inflated to $100,000. By the time the building was completed in October 1897 that figure, including furnishings, had doubled to $206.284. In an interesting twist of fate, Cyrus L. W. Eidlitz’s French Renaissance Society House sat next to his father’s Gothic church of nearly half a century earlier. The symmetrical design drew accolades from far-flung critics. The Real Estate Record & Builders Guide said “Upon the whole it is one of the most successful of our recent buildings, and is especially exemplary for the example it sets of conformity and appropriateness in a quarter in which such an example was especially needful.” Eidlitz used glazed white brick as his canvas, decorating it with carved Indiana limestone in elaborate French Renaissance motifs. As stately as a 5th Avenue mansion, it oozed respectability and permanence. Above the bracketed cornice the construction date was carved into the parapet. Eidlitz had fulfilled the want-list of the Board and more. To the rear of the second floor was an auditorium capable of seating 400 members, a model room and museum was included on the third floor, and the library filled the top floor. Upon moving in the Society’s collection numbered over 100,000 titles. The building also included the expected facilities such as reading room, lounging rooms, coat room, reception and offices. Membership continued to grow and only six years later the building was decidedly taxed for space. At the same time, Andrew Carnegie hatched a plan to construct a “national engineers clubhouse” which would bring under a single roof the American Society of Mechanical Engineers, American Institute of Electrical Engineers, the American Society of Civil Engineers, American Institute of Mining Engineers and the Engineers Club of New York. Carnegie earmarked $1 million of his own money for the project. But the Board of Direction of the American Society of Civil Engineers was concerned about its autonomy and opted out of the grand plan. Instead, to provide more space for its meetings and increased membership, it announced intentions to enlarge the existing structure. A year later in June the lot next door to the west was purchased for $100,000 and in December a building committee was meeting with architects Eidlitz & McKenzie. Construction began in June 1905 and was completed in January 1906. Although the symmetry of Eidlitz’s original structure was lost, the addition faithfully followed the design. The two-bay extension increased the size of the auditorium and library, costing the Society $61,430. The Society remained in its headquarters only for about a decade longer, however. In December of 1917 it finally joined the other engineering organizations in Carnegie’s Engineering Societies Building. It was a dark time for the United States, having been pulled into the First World War in April of that year. Not only were the country’s young men leaving to fight in Europe, rationing had already begun at home. Governing the rationing of food, the control of food prices and elimination of waste was the Federal Food Board. The American Society of Civil Engineers had barely moved out of No. 220 West 57th Street before the Board moved in. The Board found that it faced a problem with compliance with food rationing: restaurants, hotels and the rich felt that they were above the rules. These included strict rationing of wheat, beef, pork and sugar. At a meeting here on February 2, 1918 more than 150 of New York’s wealthy socialites listened as F. C. Walcott laid down the law. Using patriotic guile he diplomatically turned to the socialites. “We know that the well-to-do families will rally to our country’s cause with the greatest enthusiasm and bring the war to a successful termination. Unless they do so our fight will be lost. His words moved Mrs. F. Gray Griswold who pointed out that “a great deal could be done in the interest of food conservation by curbing the army of extravagant servants.” A mass meeting of servants and butlers to discuss the problem was arranged at the Century Theatre. In July 1918, the same month that the Board banished sugar bowls from dining cars on trains (“Hereafter travelers will receive not more than two half-lumps or one teaspoonful of sugar at each meal”), it announced that “The work has increased to such an extent that the present quarters at No. 220 West Fifty-seventh Street have become inadequate.” The Food Board moved to No. 6 West 57th. The following month the building—still owned by the American Society of Civil Engineers—was leased to the Ajax Rubber Co., manufacturers of pneumatic tires and inner tubes. Architect Arnold W. Brunner altered the first floor to house the company’s showrooms. Founded in 1905, by now the Ajax Rubber Co. was one of the preeminent automobile and truck tire and inner tube manufacturers in the country. Nine years after moving in, Ajax subleased the showroom to the luxury car maker Sterns-Knight. The automobile showroom exhibited what it called “America’s Most Luxurious Motor Car. The sublease was short-lived, however, and the company left in August 1928. 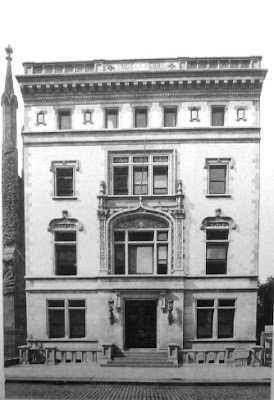 The former Society House never sat vacant for long and in March 1928 Frank G. Shattuck Co. announced it would renovate the building as a Schrafft’s restaurant. Exactly one year later the restaurant opened. By now the Schraftt’s chain, started by the maker of boxed chocolates, was famous. The 57th Street location was ideal—just steps from Carnegie Hall, Times Square and the shopping district. Schrafft’s stayed on for nearly half a decade. The in 1972 the restaurant was closed and the company’s accounting department moved into the building. Three years later the ground floor and basement became Lee’s Art Shop, which moved in from a smaller store across the street. Lee’s was already well known as a traditional art supply store and the owners commissioned MacFadyen & De Vido to renovate the space. The architects retained much of the surviving interior architecture like the stained glass of the Society’s former lounge, wood paneling and the vaulted ceiling. Lee’s enlarged upwards in 2000, adding retail space on the second floor; all the while the owners sympathetically considered any remaining remnants of the old Society headquarters. Today Lee’s is still here and the handsome façade above street level is astonishingly preserved. The building was designated a New York City landmark in 2008.